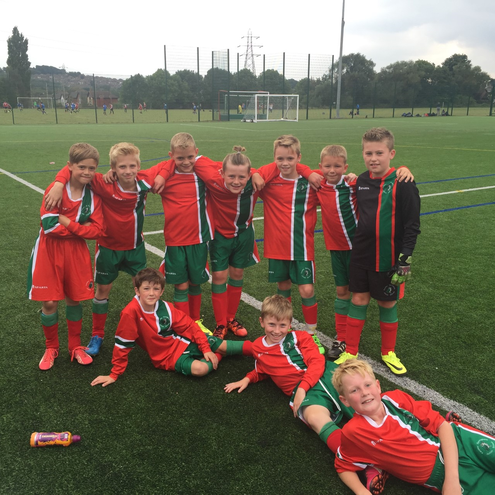 The Year 5 & 6 boys football team played at Priesthorpe school against Farsley Farfield and Calverley Parkside. Springbank narrowly lost the first game 1-0 due to a very good goal from Farsley Farfield. Springbank started well with Frankie forcing a great save from their keeper within the first minute. The game was evenly matched and the first half Owen made a great save to keep it 0-0 at half time. In the second half, again, it was very tight, Theo was close to scoring, but in the next minute Farfield scored a goal and held onto their lead. The second game ended in 2-2 draw with Calverley Parkside school. Both teams had chances to score; Owen was amazing in goal! Calverley went into the lead in the first half with George equalising in the last second before half time. Springbank had been very unlucky not to score as Luca hit the bar with a screamer from over 20 yards out! In the second half both teams had chances with Calverley sneaking ahead. Then with 40 seconds to go quick thinking from a corner by Frankie led to a great cross from Oliver being smashed in by George to equalise. The spirit from by the boys was excellent they never gave in and in the end were rewarded.